Ramp up your role-playing game (RPG) and make your character your own with this fun, interactive workbook—an essential addition to any player’s gaming kit. You’ve chosen your class, bought your weapons, and rolled for your stats, and you’re now the proud owner of your own RPG (role-playing game) avatar. But before you begin your adventure, there’s so much more you can do with your character to make him or her your own! Just how evil is she? What does his dating profile look like? Where did she get that scar? What does he want for his birthday? 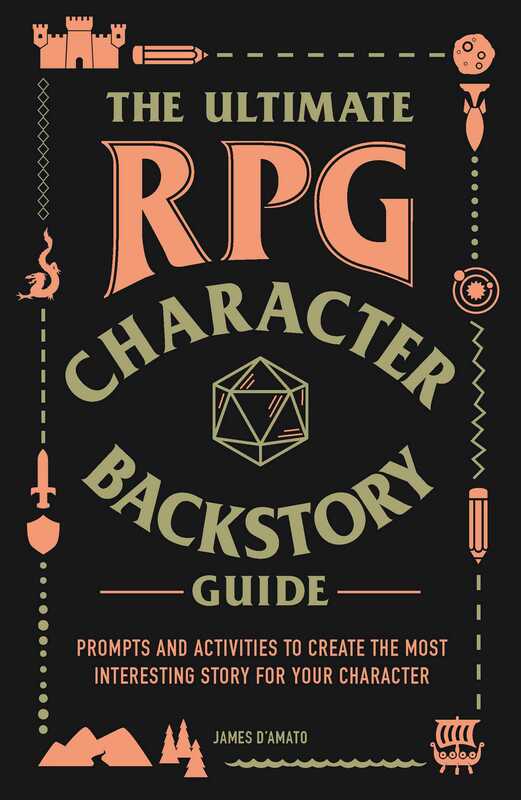 With fill-in-the blank narratives, prompts, and fun activities to help you customize your character at the start of the game, or build out your backstory as you play, The Ultimate RPG Character Backstory Book will help you fully imagine your character and bring them to life for the ultimate gaming experience! James D’Amato is the creator and game master of the One Shot Podcast, as well as several spin off podcasts dedicated to RPG gameplay. He trained at Second City and iO in Chicago in the art of improvisational comedy: he now uses that education to introduce new people to role-playing, and incorporates improvisational storytelling techniques to create compelling and entertaining stories for RPG campaigns and one-shot adventures. He lives in Chicago, Illinois and is the author of The Ultimate RPG Character Backstory Book. "Your character creating journey itself seems like a game, there’s space available to write in the book which I feel helps add to pencil and paper feel to the famed tabletop RPGs! What I like about this book is even if you don’t want to play with others, you could entertain yourself by creating characters for fun OR to help you create characters for a book or short story. From what I’ve read so far, this book is pure fun. If someone like me who knows little to nothing about traditional RPG’s could enjoy this book, then other newcomers to the genre and returning heroes from past fellowships will find something in this for them." "I took my time reading through this book, trying out exercises with new and existing characters, and handed it off to friends, both those who D&D players and short story writers. I was pretty quickly getting questions about how much it cost, ($14.00 USD MSRP, though it’s currently on sale for a lower price several places), when it comes out, (October 2nd) and if I’d be willing to let them borrow it, which I think speaks volumes. I’ve found myself reaching for the book when trying to come up with a clever little something to fit into a character’s backstory while writing a script, and have had other writers suggest they’d use it to do the same. It’s not only a useful tool for building and fleshing out characters, it’s also written in an incredibly entertaining way, making it fun way to get the creative juices flowing." "What I like about The Ultimate RPG Character Back Story Guide is that it is completely non-linear and you can make of it what you will. Even if you are not currently in a campaign The Ultimate RPG Character Back Story Guide is a fun workbook for any fantasy or RPG enthusiast. It may also be a great way to teach your children how to begin to establish their own role-playing characters and make for a fun night of creativity and adventure for the whole family. Longtime gamers know that having a character with a full and fascinating backstory makes for compelling gameplay and The Ultimate RPG Character Back Story Guide helps you do just that. Did I mention it was extremely affordable? You can pick up a copy on Amazon for a tick over $10. That’s less than almost any RPG accessory!" "James D’Amato has thought about the novice and the experienced player and has put together ‘The Ultimate RPG Character Backstory Guide’ to essentially have you be an RPG superstar…. Taking fear into account can make your role-playing character come to life by giving them a sense of humanity and creating interesting gameplay. That’s something only D’Amato has realized and gamers will be the better for it…. James D’Amato has done something special with his new book ‘The Ultimate RPG Character Backstory Guide.’ It’s akin to a graduate school course in role-playing games." "Overall, I think this is a really cool book for those of you that enjoy RPG kits, but... I think it’s also a great tool for (aspiring) character developers." "There is an argument that could be made that anyone could come up with their own backstory, but as someone who often runs into creative ruts, The Ultimate RPG Character Backstory Guide is a fantastic tool. While the obvious use is for your character in a role-playing game, I see tons of great potential for both character backstory and world building in games, writing, and general storytelling." "This is a great book for any player of RPGs and can be a valuable resource for those that act as a Game Master. Much of this book is addressed in the third person and it gives the feeling of a great attentive Game Master working out character creation you the reader as the player. We should all be so lucky to have such a GM and we should all be such thoughtful and creative players." "I can give The Ultimate RPG Character Backstory Guide the following praise - it's inspired me to want to kick off a new RPG Campaign for the first time in a year and a half. I want to DM a campaign and I want to play in a campaign. I want to pick through the guide for nuggets of inspiration, for added depth to my next game world. I can think of no better endorsement other than "this book will be used". Sadly, I can't say that for the vast majority of my gaming collection." "For me as a founder of Halo: The Lost Keys a text based RPG played via discord it really was fun and entertaining to do, and I look forward to writing some more in it." "It truly is an RPG guide that hopes to make everyone a bit more excited for the RPG experience. Again, as mentioned above, it’s incredibly useful for those trying to get a kickstart into creating a story for their friends… I can dig this guide and its purpose… Anyway, there isn’t a lot to dislike about this book. It shoots straight, it works for what it is, and it feels open. I particularly enjoyed the fact that there are spaces for writers/game masters to fill in the blanks to answer questions, as well as make notes… it is a good book that does truly act as a guide. It will certainly help to kickstart ideas for characters, stories, and situations that pure RPGers can get behind." "The Ultimate RPG Character Backstory Guide is the perfect way to create a unique character for yourself, and no two characters made using this book will be the same… Even if you don’t intend to use your character for anything, going through this book will give you an appreciation for the skill of creating characters. Whether for video games, literature, D&D or even comic books… The Ultimate RPG Character Backstory Guide is a gem for all dungeon masters, and for anyone who may find themselves with the need to create characters with depth. I could even picture indie developers who may not have their own creative resources, utilizing this book to flesh out characters in their RPGs. At $10.39 for the paperback currently, this book is completely worth the price." "In what seemed like it would be a novelty item to your RPG adventure, The Ultimate RPG Character Backstory Guide comes off far more as a requirement for crafting your character… I absolutely enjoyed this. I tried to be a bit critical and think what this book lacked. There’s really not much… The Ultimate RPG Character Backstory Guide is still a really essential guide for crafting your player character to their fullest. For me, this gave me the opportunity to delve a bit deeper into my own character in some rather interesting ways that I never thought about. Highly recommended." "And I really love some of these exercises. I’m almost always running games these days, but when I do get a chance to play I often feel like my characters’ lives are so much more nuanced than what we see on screen; these are people that I’d like to get to know better. The Ultimate Guide promises to help you do just that, and creates an avenue for you to continue playing the game without your GM or the rest of the party, and it largely succeeds." "The Ultimate RPG Character Backstory Guide will not only help spark the beginner’s mind to create a healthy backstory, but will also help veterans find aspects of their character that they may have never considered before. Anyone with an imagination could take a blank slate and come out with an interesting character on the other end. If anyone asked me for advice, my first suggestion would be this book and I would even recommend my favorite activities." "James D'Amato's The Ultimate RPG Character Backstory Guide contains a wealth of exercises that can be used to enrich RPG characters and their interactions with others through the use of improvisational storytelling techniques, something James has a great deal of experience with, having trained at Second City and iO in Chicago in improvisational comedy." "Whether you are a DM/GM that wants to encourage their players to have deeper characters and create more engaging Non-Player Characters (NPCs), or a player looking to bolster their roleplaying by establishing more about a character’s origin, or even an author in need of a tool to assist in building believable characters, relationships, and establishing world building, The Ultimate RPG Character Backstory Guide is a perfect supplement to any game’s character creation process. Ever activity is well thought out and cover a broad range of impact to the character and the world they live in. Some are silly and fun, while others dig deep into a character’s major events. For RPG veterans and new players alike grabbing The Ultimate RPG Character Backstory Guide is a sure way to expand your overall RPG experiences!" "The author James D'Amato has created a great reference guide for RPG fans with The Ultimate RPG Character Backstory Guide. The 140 page book manages to cover all the intricate details of creating the perfect character for all of your favorite RPG games. The book has a slew of activities and exercises to flesh out your fantasy character by pushing the reader to delve into their own imagination." "The Ultimate RPG Character Backstory Guide is a great resource for those who love playing tabletop RPGs. It gives a ton of simple yet effective exercises and activities that help stimulate the player’s mind as they create their character, I highly recommend adding this guide among the other handbooks that are used to create adventures." "If you’re the type of person that’s looking for inspiration in creating your next character, or if you’re trying to find ideas to make your current character more interesting, "The Ultimate RPG Character Backstory Guide: Prompts and Activities to Create the Most Interesting Story for Your Character" is worth your time. You may not use every exercise in this book, but they’re all worth reading." "In addition to backstory though, the guide also helped me consider new ways to progress in an RPG in a way that properly fit my character. That isn’t to say I had been playing wrong of course, just that I had not considered every option available, or what the best option actually was. This was another reason why the book was popular among players I shared it with, and I feel both longtime and newcomer players of RPGs will get a lot out of it. I truly recommend it a great deal." "This guide’s a little funny, a little awesome, and also perfectly geeky. The activities in this guide are super fun!" "This guide is a great addition to any adventurers’ library."